Russia has snubbed India in the recent months by cancelling two important bilateral war games, usually held under a well-established arrangement, a senior official said on Monday. 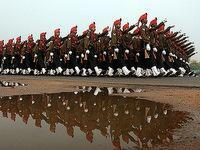 The move has raised eyebrows in the Indian defence establishment. The Russians have called off the Indra series of navy and army war games in the recent weeks, baffling the Indian defence ministry, the official said. Russia had late last month called off the Indra series of exercises with the Indian Navy, despite the latter's warships -- including guided missile destroyers INS Delhi, INS Ranvir and INS Ranvijay -- reaching Vladivostok, an eastern Russian port town on the Pacific Ocean. The reason cited by Russians for the sudden decision to do away with the naval war game was the non-availability of its warships due to their expected deployment in aid of Japan after the Fukushima nuclear disaster, the official said here. But what came as a shocker for the Indians was that the Russian warships later sailed out for an exercise of their own, instead of the cited deployment in aid of Japan. The Indian ships returned to Visakhapatnam last week without the valuable experience that would have been gained if the exercise had taken place. Indian Navy personnel instead had to contend with a face-saver of a tabletop simulation during their stay in Vladivostok, the official said. "The reasons given by the Russian navy are absurd," the official added. But the latest insult to injury was the calling off of an army exercise under the Indra series that was to be held in Russia in June. Moscow conveyed to New Delhi last week that it would not be able to host the exercise as the intimation for the war game was sent very recently without much time for preparation, the official said. Since 2003, the two countries have conducted five exercises between their armies and navies under the Indra series. The latest bilateral army exercise was held in Uttarakhand last October. The Russian moves come in the wake of India choosing two European fighter jets as the top contenders for a $10.4 billion fighter jet contract. In the process, not only Russian but also American and Swedish planes were knocked out of the competition. After being fed-up for long with delays and non-availability of spares for its Soviet-era MiG-series fighter jets, military transports, radars and missile systems, India issued several open global tenders worth several millions of dollars for the same. The two sides also fenced over time and cost overruns in the Admiral Gorshkov aircraft carrier refit, for which India is now paying $2.34 billion instead of the 2004 price of $1.5 billion, which included 16 MiG-29K carrier-borne fighter jets for $526 million. Just over six months ago, India had signed agreements with Russia for the joint development of a fifth generation fighter jet of which Indian Air Force (IAF) is likely to get about 250 to 300 planes. In fact, the IAF chief, Air Chief Marshal PV Naik, has just returned from Russia after inspecting the progress on the fifth generation jet. This apart, India and Russia have also inked a pact on developing a medium transport aircraft, of which IAF would get about 45 planes. Through these agreements, India is likely to invest over $10 billion in the two projects.